I posted on facebook a couple of weeks ago, that we were having issues with Olivia going back and forth between the big girl bed and the crib. For about a year now, we've had a twin size bed in Olivia's room that we used every night to have story time on. So, we didn't get to really use the WOW factor of having a new bed in there for her and I thought that was part of the problem. After a couple of weeks, I started noticing a trend and decided that Daddy was the one having issues with her sleeping in the big girl bed, not her. She's been in the bed ever since. To give her a little bit of the excitement factor of moving up, I decided to go buy a new comforter set and even let her get a say so on which one. I narrowed it down to two and let her pick. I might have been a little excited when she picked the one that was my first pick. I went to first look at the comforters without her and fell in love with this one. I was almost tempted to buy it for my own bed, but I knew David wouldn't go for it. 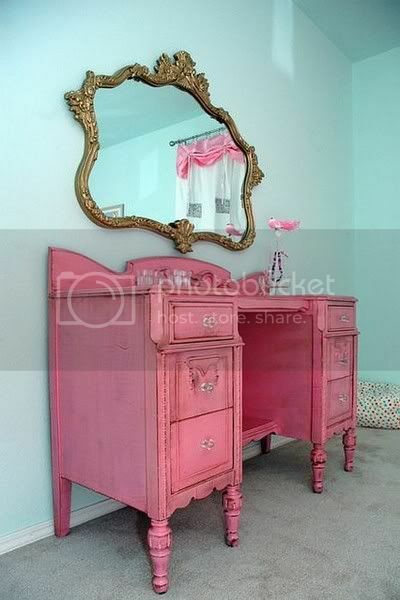 To me it easily passes for little girls room without being too kiddy. Also, I went all pink overload with her nursery since I thought it might be my only chance to paint pink on the walls, so I decided I wanted to go with something with not as much pink. This obviously has no pink, but I figured I could throw a little bit in there somewhere. As far as the transition to the big girl bed....it's been flawless. She hasn't once yet fallen out and still hasn't figured out that she can get out. She doesn't climb out till I come and get her in the mornings. The crib has been taken down and we haven't had anymore back and forth. We're officially moved up. I will say that it is bittersweet going in to check on her and seeing her laying in that big bed. I won't lie that it has made me cringe for another "little" baby. This is obviously just the beginning stages of her "big girl" room. I've promised myself that I would work on our room first some before I completely redo her room again. I already have the paint and a few other odds and ends. Like usual, I don't plan on spending much and using a lot of what I already have. Of course I've been searching Pinterest for ideas for months now and here are a few ideas I'd love to go with. 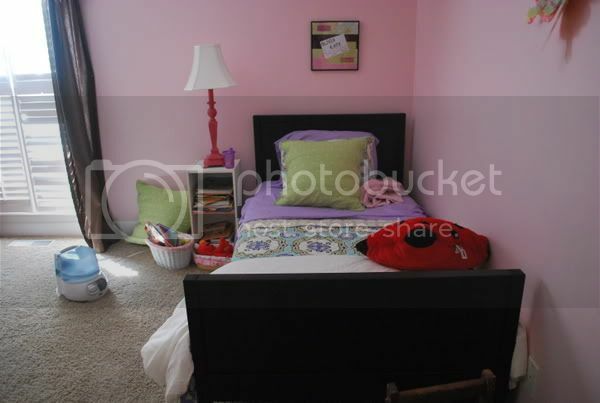 I've actually had OK's big girl room in my head for years now. I saw a picture in a magazine before I was pregnant and have loved that room ever since. I haven't been able to find that pic, but a few months ago I came across this one on Pinterest and it was seriously exactly the direction I wanted to go with. 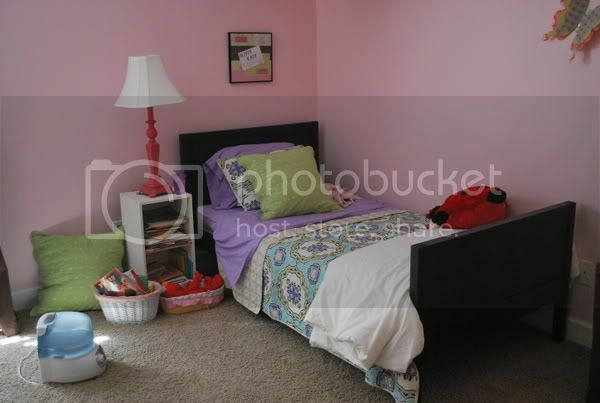 I love everything about this little girls room. The wall color, the neutrals, the pop of color from all the accents, to even the big letter above the bed. I love it all. I love this vanity set up. I have a vanity (not as elaborate as this one), but I haven't decided if I want to part with it since it's currently functioning in another part of the house. I even have a gold mirror that similar. 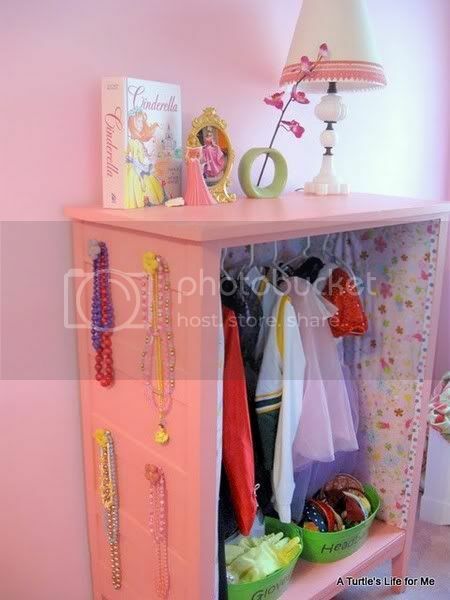 I don't think I'll go with a dresser (though its a great idea), but there is a little wall space between OK's closet door and a built in bookshelf, that would be perfect to do a little dress up station like this one. 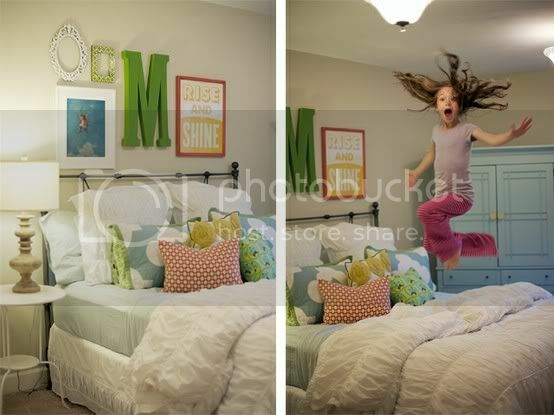 I still have dreams of OK having a little sister to share her room with one day. I've always loved the look of two twin beds in a room. 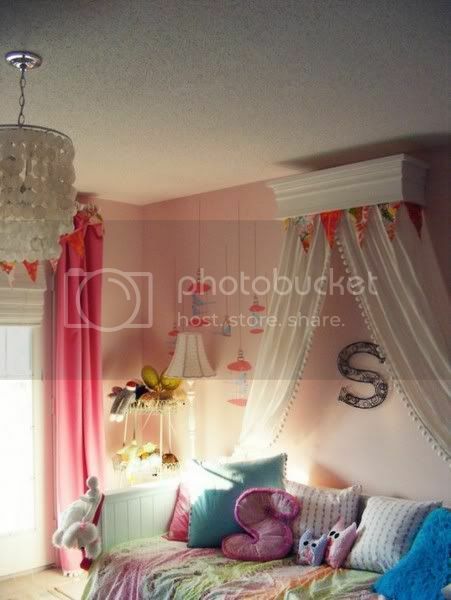 However until then, I think this bed set up and canopy would be a really cute way to set up OK's twin bed and take up more space in her (I know you don't often hear people say that, especially about kids rooms, but her room is a pretty good size). If she does not get the chance to share her room, I plan on buying her a full size bed in a few years. So, it's a start. We've got a long way to go and who knows what the next year might bring our way, to possibly change my plans for her room. Either way, I'm excited. 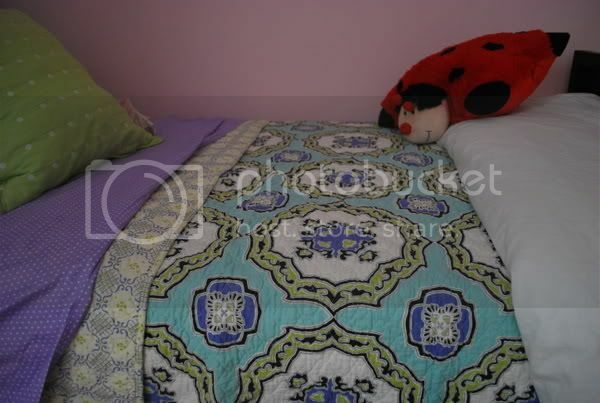 THAT BEDDING IS SO CUTE! we are moving t-a into a FULL size bed this month..lol..of course her daddy works nights most of the time so I will be sleeping with her..haha. I am SO stealing the dresser "dress up" station idea!